Health Diary # Beauty Benefits of "HONEY"
Honey or Sahad (popularly known in Hindi) is the yummiest golden liquid which is a complete energy booster. Honey is a rich source of natural sugar means it is a fusion of fructose and glucose along with various vitamins, minerals and antioxidants. You can easily replace white sugar with honey and get more health benefits.. According to ayurvedic science honey has the ability to cure so many health issues. Like ,honey is so helpful to cure bronchitis, nausea . It enhances weight-loss, improve eyesight, brings instant energy.It is a rich source of flavonoids and antioxidants which reduce the risk of heart diseases. The fusion of glucose and fructose in it helps in control the blood sugar level in body. 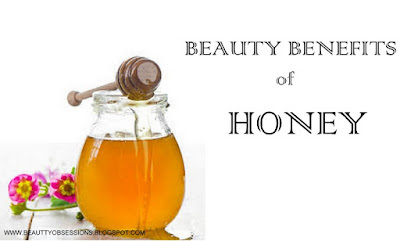 Besides that honey also has some amazing beauty benefits which I am going to mention below..
Honey is a great anti-aging agent and has good moisturising ability as well . The huge quantity of anti-bacterial substances present in honey helps to protect skin from the harmful UV rays and keeps rejuvenate skin properly. I have heard from my grand mother that ,they used to apply honey and milk on their face /skin to keep the moisture lock and to get a youthful and smooth skin. We can use honey as raw on our skin or can use in our face pack or exfoliator. Below are some ways..
1- For making Honey face pack, take 2tsp of honey, 1tsp. lemon juice and 2tsp. of fuller earth and blend well to form a paste like consistency. Then apply on face and neck with outward circular motion and leave for 20minutes to dry. Then wash with cold water. It helps to remove sun tan and gives a nice healthy looking skin. 2- For exfoliating face, take 2tsp. honey,1tsp. sugar and 1tsp olive oil and mix well and apply on face and neck with outward circular motion. Be gentle while scrubing. Then leave like this for 15minutes and rinse off with lukewarm water. 3- If you are a lazy bone like me,then you can apply raw honey directly on damped face. Just make sure not apply too much ,just apply a thin layer and leave it for 20 minutes. Then tale a little water and massage the honey in outward circular motion and finally rinse off with lukewarm water. You will get glowy skin instantly. 4- If you have dry chaffed lips ,then take 1/2tsp. or less than that sugar and add 1tsp of honey into it and scrub your lips with this so gently. Within few seconds you will get well exfoliated smooth soft lips. 5- Lukewarm water with 2tsp of honey helps to burn the extra calories of body... but this process is a long term basis but successful one. 6- Honey can also be used to condition dry fizzy hair... Just take 2tsp honey and add 2tsp. coconut oil into it and blend well. Then after shampooing apply this mixture on the lower 3/4th of your hair and leave like that for 20 minutes. Then rinse well. It adds nice shine to hair. Amazing post!! My hairs are bit unruly because of wavy texture, great tip! !